I was one of the lucky few who was able to peek into SM Ladies' Spring/Summer 2013 PFW Collection. The press preview was held in a nice resto at SM Mall of Asia. Here are photos from that beautiful day! Starting this post with what I wore... Thanks Lush Angel for patiently taking my photos! Hihi. I've been living in this Rockport Presia heels for days now. Not sure if you already know (announced it on Instagram already) but it's soles are made of Adiprene by Adidas, so it feels like you're just wearing one of their running shoes. I can wear this for hours and it doesn't hurt one bit. And that's coming from me who has heavy feet which makes walking in heels an agony. So a big YAHOOOO for this amazing technology! Anyway, the dress is a new favorite from Jhajing. Wish they're detachable though so I could style them separately. Anyway, photos from the event! 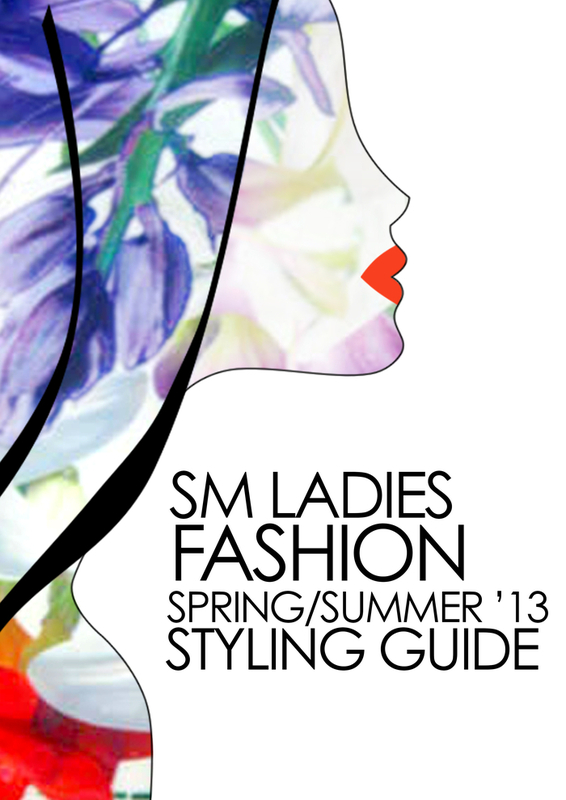 SM Ladies’ Fashion, once again, gears up for Philippine Fashion Week 2013. The grand show on May 22, 8 pm at the SMX Convention Center, is set to feature a smorgasbord of geometric patterns, jewel tones, summer brights, and New Florals—an array of multi-faceted prints in abstract, oriental, and canvas-like variations. Fans can expect a full range of retail offerings catering to different style tribes, as well as surprise celebrity appearances. cute table setting + enticing cupcakes! “This year’s show celebrates womanhood and the different facets of the stylish woman,” says Charlene Yu-Banzal, Vice President for SM Ladies’ Fashion. “Our vision is to give our customers a wider berth of choices so they can better explore their style persona. SM Ladies’ Fashion continues to elevate affordable ready-to-wear apparel with brand offerings that meld international fashion trends and consumer demand. The show is segmented into various style tribes—Corporate, Ladies Who Lunch, Weekender, Party, and Resort. The SM woman is poised to find her style personality, represented by this grand collection. Rule the boardroom in corporate wear from Folio and SM Classics. Tailored shapes, elegant fabrics and powerful silhouettes in bold hues will take you straight to the top. Aim for success by pairing a fluorescent pantsuit with an elegant floral top. Burst into spring with exotic oriental blooms from Philosophy and NY Square, designed to make tea time a very stylish affair. Let watercolor florals liven up jackets and shift dresses for a look that spells soft femininity. Boldly pair floral separates in one ensemble, or play the classic femme in a shift dress topped with a soft spring-print blazer. Go from sea to sidewalk in Coco Cabaña, the only local swimwear line that covers the day-to-night resort lifestyle. Surf and swim in on-trend bikinis, and lounge in sheer floral cover-ups. Dress up your maillot, and party by the sea in a sheer overlay that sways with your every move. Shine bright in rich, jewel-tones from Studio S, guaranteed to make you the life of the party. Be a gem in a curve-enhancing dress that can take you from work to play, in an instant. The Spring/Summer 2013 collection promises a vibrant display of SM staples and on-trend items, all curated by leading industry experts. with my blogger loves Sarah, Ana, Ava, Arnie, Earth and Angela:) We all loved what we saw! Check out related offers on discounts by visiting the SM Ladies’ Wear Department at select SM Stores nationwide. Natatawa ako dun sa who looks like blogger keigh jalbuena noh?! Hahahahahah!